We pride ourselves on the quality of our beachwear kaftans and this perfect, lightweight top will make you stand out from the crowd. The 30" kaftan has open armholes to create an easy, free-flowing, flattering silhouette, while the side-seam stitching gives the piece structure and stability. The overall look is reminiscent of a breezy, loose-fitting blouse with a modern, rounded hemline. The kaftan comes with a matching belt to give a more fitted look. Our resort wear collection is handmade using only the finest quality fabrics. Each kaftan is made to a high standard and great attention to detail is paid as each piece is beautifully finished with a satin edge. The pattern on each kaftan may vary in position slightly depending on the cut and the print making no two kaftans the same. 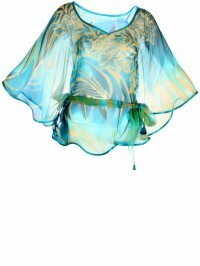 Some kaftans in the resort wear collection are embellished with embroidered flowers.